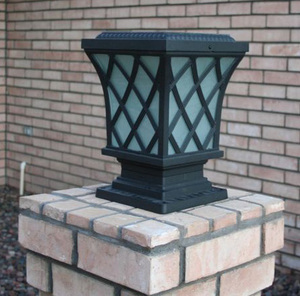 The Premium Classic Solar Fence and Pillar Light offers a classic, sleek black finish. It's easy to install and offers the same level of light as a line voltage fixture. This Solar Pillar light functions both as a lighting solution and decoration that can be easily mounted on square posts or columns. • Now features selectable color output! Switch between cool white or warm white output with the flick of a switch! • Due to various applications, mounting hardware is NOT included and can be purchased locally at a home improvement store. Light goes beyond our expectations. It is really bright. The fact that you can change brightness is a wonderful option. Looks elegant on our pillar. This Soar Pillar Light exceeded all expectations. I would recommend this to anyone who wants to have an excellent decorative lighting fixture that gives you light from dusk to dawn. I ordered 2, I was so happy with there brightness I ordered 2 more. Can the battery be replaced if/when they stop working? What kind of bulb is used in this fixture? Could the bulb be easily replaced? This fixture features 36 x Hi Power Bridgelux LEDs. They are not designed to be replaced by the customer but can be replaced by a technician under the manufacturer warranty if need be. Thank you for your inquiry! How sun exposure is required for solar lights to work? In the front of our house, left side is shadier then the right. We recommend a minimum of 6-8 hours of direct sunlight daily. Thank you for your inquiry! is the the light surrounded by glass panel or plastic? The frosted material on this fixture is composed of a heavy duty plastic material. Thank you for your inquiry! Will I be able to paint it white since it does not come in white? If it does come in white how do I get it? The Premium Classic Solar Pillar Light is not available in white. It only comes in a Black or Bronze. Please note if you do paint the fixture it may void the manufacturer warranty. Thank you for your inquiry! There are 4 pre-drilled holes in the base to mount to a flat surface. You would need to pre-drill corresponding holes in the concrete pillar to and use concrete screws to properly mount this fixture. Thank you for your inquiry! Is the switch at base off @ center position? Are the Left and Right toggle positions for type of light desired? You are correct. The middle switch will allow you to turn the fixture both on and off. To the left and right will allow you to adjust the color output. Thank you for your inquiry! The dimensions on this product are 13" (Height) x 9.25" (Top) x 7.75" (Bottom). Thank you for inquiry! Does the base come off for installation? The base does not come off for installation and can be mounted to your subject matter as is, using the pre-drilled pilot holes in the base. Thank you for your inquiry! I would love this with a flickering light. Any possibility to find a bulb that would be compatible? This fixture features constant dusk to dawn operation and cannot output a flickering operation. Thank you for your inquiry! does this light have an accessible on-off switch? Yes, it does indeed. Thank you for your inquiry! Can we choose the temperature color? I want it to be 3000K (Warm White) but there is no selecting option on the web. These fixtures now feature the ability to switch between cool white or warm white output with the flick of a switch! 6000K (Cool White) or 3000K (Warm White). Thank you for your inquiry! i HAVE A CONCRETE PILLAR........HOW DOES OT ADHERE TO CONCRETE? i HOPE BY AN EPOXY...... I DONT WANT SCREW HOLES IN THE PRODUCT....DOES IT HAVE SCREWW HOLES? There are 4 pre-drilled holes in the base to mount to a flat surface. You would need to pre-drill corresponding holes in the concrete pillar to and use concrete screws to properly mount this fixture. can I get them in different colors Like brown or stain color? The Premium Classic Solar Pillar Light is also available in a Bronze finish and can be found here: http://www.earthtechproducts.com/bronze-premium-pillar-light.html Thank you for your inquiry! Will this fit a 6'' fence post? The bottom dimensions are 7.75" inches, meaning it will not accommodate a 6" fence post. Thank you for your inquiry! The Premium Classic Solar Pillar Light In Black includes one fixture. Thank you for your inquiry!